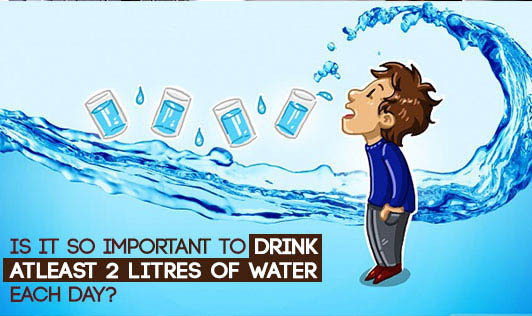 Is it so important to drink atleast 2 litres of water each day? One of the top 3 diet advices we get from experts is to drink atleast two litres of water each day, but...is it necessary or just another myth? To find this out researchers took the help of beauty conscious twins. One of them was asked to give up on the two litres of water she drinks and get her fluids from tea, coffee and juices. The other continued with her water intake. An expected result was a dehydrated and less moist skin of the water restricted twin. At the end of five days some tests were conducted to find out if the water starved twin was affected by this. Strangely there was no major change in the moisture and elasticity of her skin. The funda that we need atleast two litres of water is to compensate the fluid loss that happens each day through sweat, urine. Well ...but all the fluid does not have to be replenished by water but can be in any form like tea, coffee, juice and even from fruits and vegetables. Soooo... drink water only to quench your thirst!! !